Made from 100% pylon, the Portwest Pylon Knitted Assembly Gloves A020, are designed to provide dexterity and maximum tactile feedback. 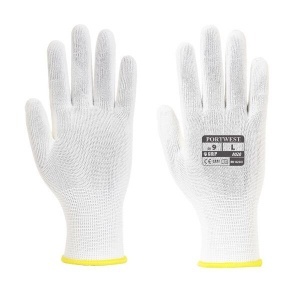 Their 13 gauge liner provides both a comfortable fit and excellent grip, making the gloves ideal for any industry where low-risk general handling applications are required. The Portwest Pylon Knitted Assembly Gloves are extremely lightweight and nimble, making them perfect for fast-use applications where handling and inspection is required. They offer maximum tactile feedback ensuring that the user has total control over what they are handling. The gloves are highly durable and are supplied in a box of 960 pairs. The Portwest Gloves A020 are available in five sizes that should be suitable for most users. To find your perfect pair, please measure the circumference and length of your palm and match the results to the table below.